New Big Finish! Jago & Litefoot & Strax! Big Finish continues to bring modern era Doctor Who characters into their audio range and their newest addition is Strax, as played by Dan Starkey. In case you didn’t already know, Jago and Litefoot first appeared in the classic Fourth Doctor serial “The Talons of Weng-Chiang.” The characters played by Christopher Benjamin and Trevor Baxter respectively, have been stars of their own Big Finish audio series for a while now. I can’t wait to see what adventure these two get up two with our favorite Sontaran nurse as he takes a brief break from being part of the Paternoster Gang. “The Talons of Weng-Chiang was one of my favourite Doctor Who stories growing up, first in its form as a Target novelisation and then in the prized VHS I got for Christmas 1988. Spool forward nearly 30 years, and I’ve been lucky enough to encounter Jago and Litefoot in their audio incarnation already, with my turn as Mr. Tibbs in Series 9. 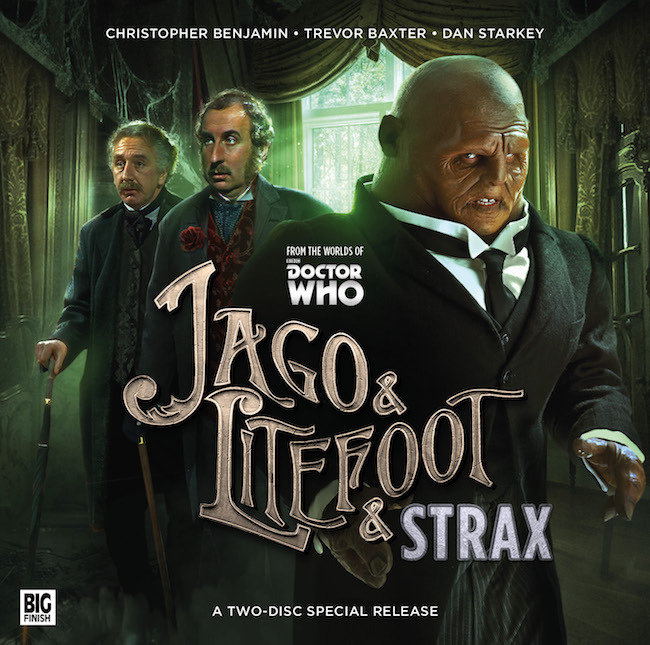 Jago & Litefoot & Strax will be released as a 2-disc special in November and will launch at the Doctor Who Festival in London on 13, 14 and 15 November and is available for pre-order here.